For maximum growth, yield, crop quality and orchard longevity almonds trees should be supplied with water to meet their full water requirement. There are some disease concerns with hull rot under full water conditions which can be addressed with moderate water stress during hull split. (Teviotdale et al. 2001) If water availability is limited, growers can react by applying irrigation water when trees are most sensitive to stress and by taking measures to minimize water losses that occur during irrigation events. Supplying less water than the trees can potentially use reduces soil water availability, causes tree water deficits, and reduces transpiration. Cover crops, depending on the coverage and the time of the season in which they are grown can increase the orchard water use by up to 30% . Cover crops should be removed when water is in limited supply (Prichard et al. 1989). 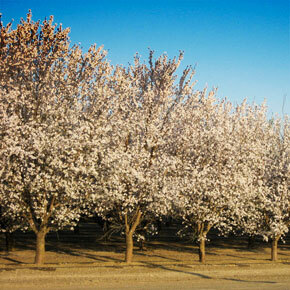 Water deficits affect almond orchards not only in the year in which stress occurs, but also in the following seasons. Generally, nut size is reduced in the first season of significant water stress. Because water stress also reduces vegetative growth and potentially decreases productivity per unit canopy volume, nut load can be reduced in subsequent years (Lampinen et al. 2007). 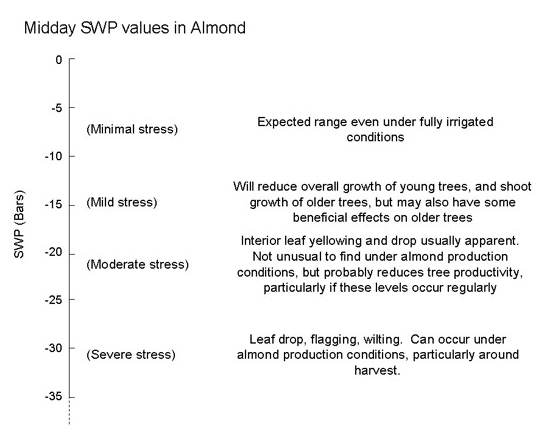 Recent research indicates some stages of almond fruit growth are more sensitive to water stress than others. Understanding these stages permits growers to withhold water while minimizing damage to trees and to current and subsequent crops. Water stress affects more tree and crop development processes during the early season - from leaf out through shoot growth and development of terminal and lateral buds. During this period, rapid vegetative development is necessary for canopy development and fruiting positions for the following season. (Goldhamer et al. 2006) (Prichard et al. 1994) In addition, orchard water use during this time is low compared to summer demand, reducing potential water savings from an early-season deficit irrigation strategy. Nuts undergo a rapid growth phase early in the fruit growth and development period and are sensitive to water deficits during this time. However, trees can tolerate drought stress fairly well during the two months prior to harvest, allowing for the successful use of deficit irrigation strategies during this period. (Shackel et al. 2004). Providing less than the full water requirement to cause moderate water stress during this period, will have little influence on kernel weight. However, severe water stress in the months leading up to hull split will reduce kernel weight and significantly reduce hull spliting. A one-inch irrigation prior to hull split will mitigate the water stress impacts and will improve hull split and reduce the number of hull-tights. (Prichard et al. 1994) If drip irrigation is used, possibly less irrigation can provide the same benefit, but this has not been proven in the field. The effect of water deficits during the postharvest period are substantially affected by 1) pre harvest water deficits and 2) the quantity of water use over the remainder of the season. Bud differentiation can continue through mid-September. Moderate stress during this period will have little effect on subsequent year's nut numbers, but severe stress during bud differentiation has been found to dramatically reduce fruit set the following spring (Goldhamer et al. 2006). In early harvest (early August) districts, particularly with early varieties, more of the high water use season remains after harvest. This increases the necessity for postharvest irrigation. Later harvest (north State) districts and later varieties have a slightly shorter postharvest period which occurs at a time of lower crop water demand. These factors reduce the chance of moderate water deficits causing bud differentiation problems (Prichard et al. 1994). Tree response to postharvest stress can be influenced by the type of irrigation system used, and the previous irrigation management. Low volume systems with limited soil water reserves can result in severe water deficits very quickly after irrigation cut off. In the southern San Joaquin Valley where harvest is earlier than in the north, or with drought-sensitive varieties, postharvest irrigation is a necessity. Deep rooted, surface irrigated trees may have enough pre-harvest deep moisture remaining to carry them through the critical period of bud differentiation. This all depends on the irrigation management occurring pre-harvest. Almond water use begins when the leaves develop and shoot growth begins. Concurrent with canopy development, the climatic demand increases, driven by longer days and higher temperatures and low humidities as the season progresses. Both of these factors result in a seasonal water use starting at a low level, peaking in mid-season and falling as season ends. Sources of water available to trees include: soil-stored moisture (including frost protection water applications if the root zone is less than field capacity when applications are made), any in-season rainfall absorbed by the soil, and applied irrigation water. These all combine to determine the total seasonal water available to the orchard. 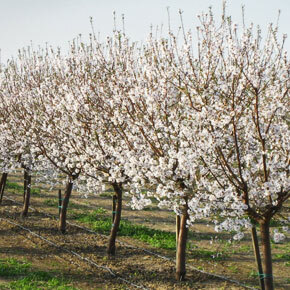 Mature conventionally spaced almond trees in the Southern Sacramento Valley can use about 41- 44 inches of water in an average year of unrestricted water use. High-density orchards, long pruned orchards, or those with a cover crop can have even higher use. . Soil moisture monitoring demonstrations in more than 40 almond orchards in Kern County indicate that seasonal water use in the southern San Joaquin Valley may be as high as 50 - 54 inches (Sanden 2007). 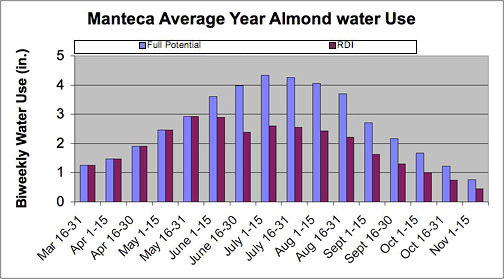 Figure 1 shows a typical water use pattern for fully irrigated and a deficit irrigation regime for almond in the Manteca area. The moderately deficit irrigated orchard used (in a combination of soil supplied and irrigation water) 28 inches of water or about 34 % less than the full potential orchard. From the previous discussion it can be concluded that tree water use from leaf out through mid June should not be compromised. From mid June through harvest, reductions up to 50% of full water use have been successfully used to reduce orchard water use with only minimal reductions in kernel weight. It is important to supply the trees with water near hull split to avoid hull-tights. There are various approaches growers can take to manage limited water supplies depending on what types of irrigations scheduling tools interest or are available to them. A simple method is to reduce irrigation run time or lengthen irrigation intervals to obtain the desired percentage of irrigation reduction in applied water. In a four-year study investigating pre-harvest, post-harvest, and uniform deficit irrigation for the entire season, the best results were achieved when water applications occurred at a uniform deficit rate across the season relative to full potential crop ET. The uniform deficit rate does not mean a uniform irrigation amount across the season (e.g. 1.5 inches each week), but rather a uniform (e.g. 85%) reduction of full ET for each period. Deficit irrigation rates of 55%, 70%, and 85% were tested with the 70% and 85% irrigation reduction treatments showing little yield loss compared to the full ET treatment. (Goldhamer et al. 2006) The 70% and 85% uniform across the season deficit treatments experienced little early season stress, likely because stored soil moisture supplemented the applied irrigations. Another approach that is likely an improvement over the approach outlined above is to schedule irrigations using periodic pressure chamber readings and irrigate when midday stem water potential reaches a pre-determined threshold stress level (see Figure below). This method effectively extends the irrigation interval, but the interval is determined by tree water status rather than the calendar. Irrigations should be in the volume of a normal set as performed with a full irrigation regime. In a deficit irrigation study conducted on mature almond in the Manteca, CA a just prior to irrigation threshold value of -20 to -22 bars midday stem water potential beginning in June resulted in 34% less tree water consumption and no significant influence on yield for the 4-year measurement period. (Prichard et al. 1994) It should be noted that a reduction in vegetative growth was measured in this treatment, indicating that use of this threshold for a longer-term strategy (more than 4 years) may reduce yields by reducing nut numbers. The impacts of stress on a developing tree canopy is much more detrimental as opposed to the impacts on a canopy that has already reached it's full volume. Less is known about this strategy since it is a rarely used option. However, based on past drought conditions, trees may be kept alive with about a foot of applied water. This strategy does not consider growth and yield-just tree survival. This strategy is best conducted using a micro-irrigation system which maximizes water distribution and minimizes evaporative losses from irrigation. Using this strategy no irrigation is applied until water potential reaches -16 bars from leaf out through the end of May. Monitor stem water potential until the threshold is reached again then repeat the cycle. After June 1st, and for the rest of the season allow the stress to climb to -25 bars prior to irrigation. As a guide, try to just retain the leaves on the tree. Good luck, as this is only a guide. Remember that following this severe deficit strategy, it will take at least 2 years of full irrigation for the trees to recover to normal yields. Fulton, A., Buchner, R., Giles, C., Olson, B., Walton, J., Schwankl, L., and K. Shackel. 2001. Rapid Equilibrium of Leaf and Stem Water Potential under Field Conditions in Almonds, Walnuts, and Prunes. HortTechnology 11: 502-673. Fulton, Allan. 2007. UC Research on Deficit Irrigation of Almonds. Column written for Trade magazine publication. Goldhamer DA, Viveros M, Salinias M. 2005. Regulated deficit irrigation in almonds: effects of variations in applied water and stress timing on yield and yield components. Irrig. Sci. 24(2):101-114. Lampinen, Bruce, Ted DeJong, Steve Weinbaum, Sam Metcalf, Claudia Negron, Mario Viveros, Joe McIlvane, Nadav Ravid and Rob Baker. 2007. Spur Dynamics and Almond Productivity. 35th Annual Almond Industry Conference Proceedings, Dec. 5-6, 2007, Modesto, CA. Pp. 73-77. Prichard, T.L., W.M. Sills, W.K. Asai, L.C. Hendricks, C.L. Elmore. 1989. Orchard Water Use and Soil Characteristics, California Agriculture, 43:4, 32 p. 23-25. Prichard et al. 1994. Comprehensive Project Report, Project No. 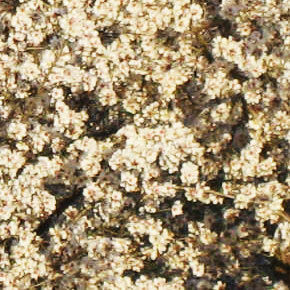 93-H5 - Effects of Water Supply and Irrigation Strategies on Almonds. Report to CA Almond Board. Sanden, B. Â 2007. Â Fall irrigation management in a drought year for almonds, pistachios and citrus. Â September Kern Soil and Water Newsletter, Univ. CA Coop. Ext., Kern County. Â 8 pp. Shackel et al. 2004. Final Report (2004 and 2001 - 2004 summary): Deficit Irrigation Management During Hull-Split. Report to the CA Almond Board. Teviotdale BL, Goldhamer DA, Viveros M. 2001. Effects of deficit irrigation on hull rot disease of almond trees caused by Monilinia fructicola and Rhizopusstolonifer. Plant Dis 85(4):399-403.